With 1990's 39/Smooth, a young trio going by the name of Green Day started to generate some buzz in the Bay Area's burgeoning punk scene. With their sophomore set Kerplunk, they became one of Lookout Records' most successful acts, but the word got out on these upstarts and major labels came calling. "I think we just wanted to see what the possibilities were," recalled frontman Billie Joe Armstrong to Green Day Authority. "Up to that point, Kerplunk was movin' right along and we were booking our own tours. We were already on Lookout, which I thought was the ultimate independent label, so we didn't really want to go to a bigger independent label. If we were going to make a switch, let's take a chance." As it turned out, a producer named Rob Cavallo, who was representing Reprise Records, caught their attention. The band was familiar with Cavallo's work with a group called the Muffs and were intrigued by what they could accomplish together. "He made the Muffs record and we liked it a lot," said Armstrong. "If we were shooting for any kind of sound, that was it. And Rob was great. He understood what kind of guitar and drum sounds we were looking for." As for receiving their advance, Armstrong told Rolling Stone, "I remember thinking, 'Let's just record this thing and make sure we have money left over, so we can pay our rent, in case anything happens." With money in hand and a major label deal, the anxiousness to get to work was overwhelming. The singer says, "There were nerves. We felt like little kids in a candy store. But Mike and Tré were tight. That album was some of the tightest they'd ever played. We were ready. We didn't want to be one of those bands that got stuck in the studio. We heard about record labels telling bands, 'This is what's wrong. Make it again' – horror stories about spending all this money. We were like, "F--k that s--t. We're going to record this and be done." However, in the midst of the recording, the band saw a shift in the attitude of their fan base. The punks who embraced them during the early years of performing at 924 Gilman St. were turning against them after learning they had signed a major label deal. Accusing the band of selling out, the scene kids made their statement through attendance at one of the final shows the group played at the venue. "In the middle of recording Dookie, they made their final appearance at 924 Gilman Street,” recalls Neill King. "That hole‑in‑the‑wall is basically where they came up, but the word had gone around that they'd signed with Warner Brothers and hardly anybody was there. 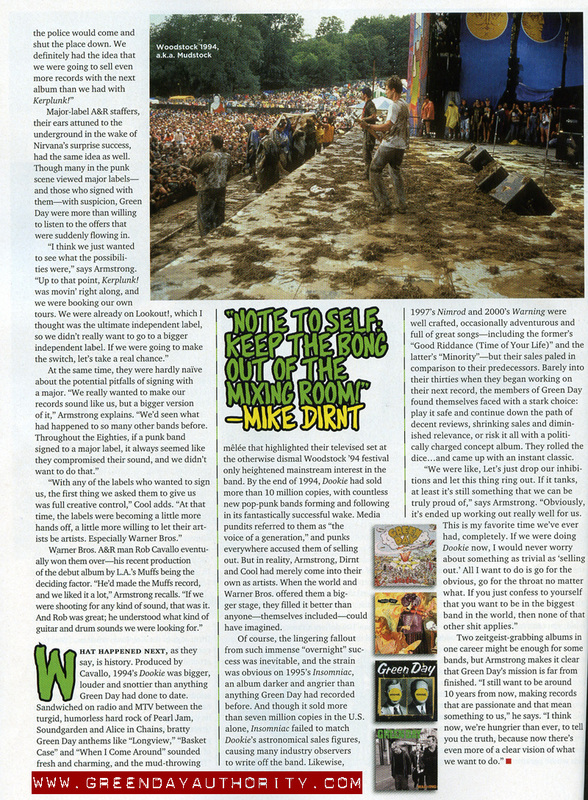 It was amazing.” In fact, not long after, the club banned Green Day seeing the move to Reprise as a slight to the scene. "I couldn't go back to the punk scene, whether we were the biggest success in the world or the biggest failure," Armstrong told Spin. "The only thing I could do was get on my bike and go forward." So forward it was, with the band powering through the disc. The recording session lasted three weeks and the album was remixed twice. Armstrong penned a majority of the material, though Mike Dirnt and Tre Cool took the writing lead on two individual tracks on the album. The band wrote about their lives and what they knew, unafraid to voice their opinion and that honesty really connected with listeners. "For me, it was important to have an opinion – and to be an individual," said Armstrong to Rolling Stone. "There was a lot of whining in rock at that time. By nature, we're extroverts. So that's what came across in our songs. We knew we were entering an arena of bands that we didn't like [laughs]. It was important for us to be ourselves, no matter what, and have a devil-may-care attitude about it. F--k it – life is pretty silly." On Feb. 1, 1994, Green Day released their third album, Dookie. And coinciding with the album's release was a new single called "Longview." While the title is not mentioned in the song, the name came from the city in Washington where the band first performed the track in 1992. Featuring a very well known opening bass line from Dirnt, the track pulled in listeners. Armstrong and Dirnt would later reveal that the bassist was under the influence of LSD at the time of coming up with the line and while he almost forgot it, the parts he remembered formed the musical starting point for the song. "When Billie gave me a shuffle beat for 'Longview,' I was frying on acid so hard," recalled Dirnt to Rolling Stone. "I was laying up against the wall with my bass lying on my lap. It just came to me. I said, 'Billie, check this out. Isn't this the wackiest thing you've ever heard?' Later, it took me a long time to be able to play it, but it made sense when I was on drugs." With the beat in place, Armstrong then wrote lyrics about boredom and masturbation. Upon its release, the band issued a hit video to MTV and the song took off at radio, climbing to No. 1 on the Modern Rock chart and breaking through at No. 13 on the Mainstream Rock chart. A year later it would receive a Grammy nomination for Best Hard Rock Performance. "Welcome to Paradise" would become the second single off the album. Though it's gone on to become a fan favorite and did well at radio, the track was somewhat eclipsed by "Basket Case" which was issued a short while later. The track initially turned up on the band's sophomore set Kerplunk, but after making the jump to Reprise, the band decided to give it a second try with a less grainy sound. "It's about West Oakland, living in a warehouse with a lot of people, a bunch of artists and musicians, punks and whatever just lived all up and down, bums and junkies and thugs and gang members and stuff that just lived in that area," said Armstrong. "It's no place you want to walk around at night, but it's a neat warehouse where you can play basketball and stuff." The track would climb to No. 7 at Modern Rock radio. As stated, "Basket Case" was released a little over a month after "Welcome to Paradise" and bit into the audience a little bit. The track claimed the No. 1 spot at Modern Rock radio for five weeks and jumped to No. 9 at Mainstream Rock. Buoyed by a brightly hued video in which the guys appeared to be patients in a mental institution, the song also got major love from MTV, where it received nine MTV Video Music Award nominations. Once again, Armstrong drew from a personal place for the track, expressing his anxiety over his panic attacks. "The only way I knew how to deal with it was to write a song about it," said Armstrong to Sound on Sound. Years later, he would tell Rolling Stone, "'Basket Case' became this loser national anthem. But to say it's about panic attacks is limiting. It's about going through total confusion. I think of a song like 'American Idiot' as feeling, 'OK, there is a lot of chaos in the world, people getting murdered.' There is no way to make sense of a world like that. You feel like a victim of it. 'Basket Case' is the same way." In 1995, "Basket Case" would earn the band a Best Rock Vocal Performance by a Duo or Group Grammy nomination. The fourth single, "When I Come Around," arrived on Jan. 31, 1994. Armstrong penned the track about his split from his girlfriend Adrienne after a blowup, but after writing and recording the song, the couple reconciled and she eventually became his wife. Like its predecessor, "When I Come Around" would top the Modern Rock chart, spending seven weeks at No. 1. It also became the band's biggest hit off the record at Mainstream Rock radio, peaking at No. 2. The final single, "She," was not issued commercially, but did enjoy a strong run at both Modern Rock and Mainstream Rock radio. Armstrong had penned the song about a girlfriend who showed him a feminist poem. When the couple split and she moved away, he decided to use the song and it's become a fan favorite over the years. As we now know, Green Day knocked it out of the park on their major label debut. The band exploded to superstardom, graduating from a "bookmobile" they used for touring to playing around the world. Their infamous "mud fight" during Woodstock '94 got them plenty of attention, and an appearance on Lollapalooza helped them to continue catching lightning in a bottle. Armstrong says of the disc, "Back then, I just wanted to write songs I could be proud of and be able to play in five years." By the time all was said and done, Dookie peaked at No. 2 on the Billboard 2000, went on to reach Diamond certification for shipping over 10 million copies and received the Grammy for Best Alternative Music Album in 1995. Mission accomplished, Billie Joe.